Today is Tax Day in both Oregon and the U.S. so everyone’s personal income tax returns should be submitted electronically, like approximately 80% of taxpayers last year, or postmarked, like the other 20% of us (me included), by today. Given that Oregon is an income tax state (personal income taxes make up 85% of the General Fund in 2011-13), and we are now at the deadline for filing, our office suddenly becomes popular at this time of year as stakeholders take interest in how the revenues are coming in. Unfortunately, although today is the deadline to file, we won’t know what all those returns hold for a couple of weeks. So far, our forecasts remain consistent with the observations of our revenue advisors and the early returns that have come in, but the majority of taxes to be collected have yet to be processed. The Department of Revenue is working as fast as it can, however the mail room and processing center are flooded with returns. Last year there were about 1.6 million returns to work through, so this year we can expect a similar, yet slightly larger pile. Returns with taxes due – in particular larger tax bills – generally do not arrive until the deadline and even then, a number of these taxpayers file extensions. However, we do see a lot of returns that receive refunds early in the tax season. Not only do households want their refund checks, these filers also tend to have less complex returns to fill out. As seen in the first graph below, by the end of March we have sent about 55-60% of the season’s refunds out the door. 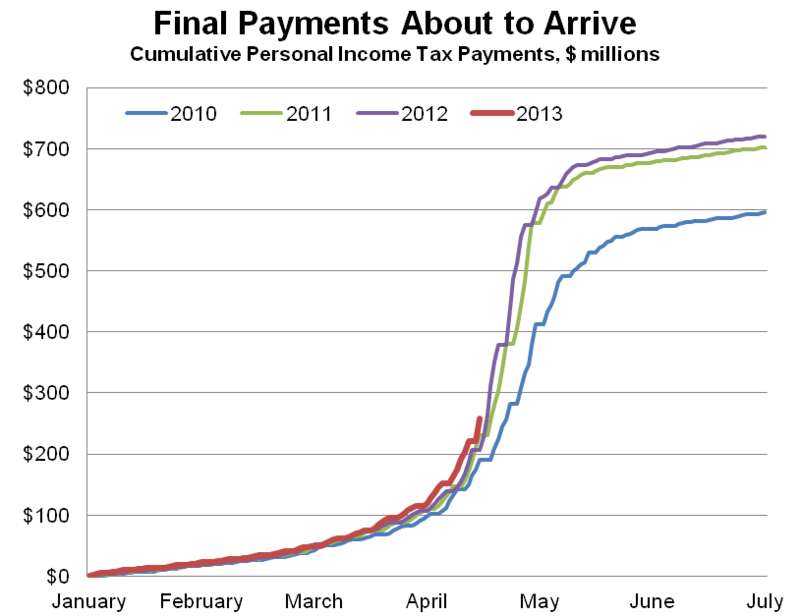 By mid-April this figure rises to about 70% of refunds eventually processed. So far, refunds are coming in along the lines of what was seen in 2012. Data used in the graph below comes from the monthly financial statements. The dotted portion of the 2013 data is our projection for April based on data for the first half of the month. Tax payments, on the other hand, are different in that they generally arrive and are processed right around the tax filing deadline in mid-April. 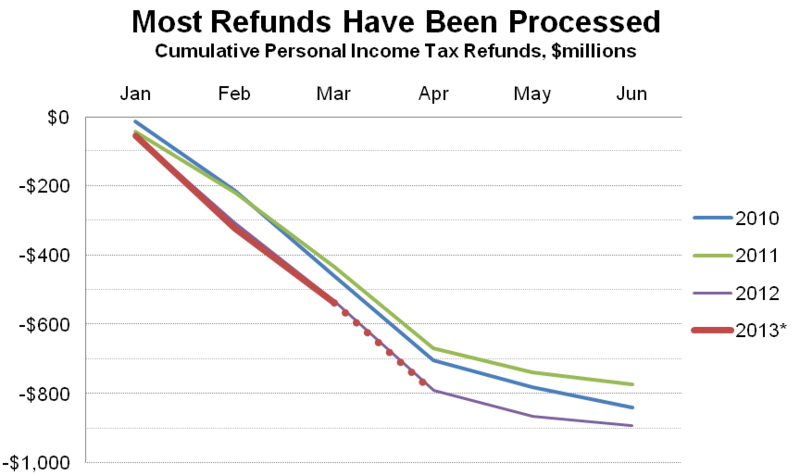 The graph below shows cumulative personal income tax payments – what we refer to loosely as “final” payments – over the tax season based on the daily banking reports. This includes everything except for quarterly estimated payments and withholding from paychecks. Actual collections are a little bit larger than these number indicate, since the daily banking reports do not represent a 100% count, but the pattern remains the same. As of mid-April we usually have about 29-30% of these final returns processed, with the bulk still to go. From now until early May, the Department of Revenue will process at least a few hundred million dollars in tax payments and by the end of June that will be over half a billion dollars from where we are today. In terms of how these figures relate to the forecast, so far so good, but the verdict remains out given how much more revenue there is to be processed. Our outlook for refunds calls for refunds to be a bit larger than last year, however so far they have been the same. This means a boost to state revenue above the forecast, all other things being equal. Final payments so far are a coming in above 2012 levels, consistent with the strong 18% growth that we are expecting for the Jan-Jun period as a whole. This growth has to do with a growing economy in 2012, but also two very important items that impact larger collections: a sizable gain in the stock market (S&P 500 ~13%) and also a pull-forward of investment income into 2012 in response to the higher federal tax rates in 2013. Dividends, bonuses and capital gains were pulled into late 2012 to avoid the higher federal taxes in 2013 and beyond, thus propping up collections this tax season, but coming at the expense of collections in future years – you can only cash in a capital gain once. Overall, personal income tax collections are coming in roughly on track with our latest forecast, but it is still about 2 weeks early to know for sure. Our next forecast is scheduled to be released May 16th, and will incorporate both the actual collections this tax season plus an updated economic outlook. Posted in Income, Miscellaneous, News | Tags: April, collections, deadline, Economy, Forecast, Income, income tax returns, monthly financial statements, Oregon, Payments, Personal, personal income tax, Personal Income Taxes, refunds, Revenue, State, Tax, tax day, tax deadline, tax season, tracking, U.S.